My Zesty Pinto Beans and Rice Dish will give you a complete protein main course. If you want to learn to eat healthier dishes with less expense, then beans and my Zesty Pinto Beans and Rice Dish should be on your grocery list. I don’t know about you, but hearing what they feed livestock these days to spur their growth with tons of hormones and the like can be a scary option. Since I watched a documentary on the beef industry and how those animals get to market, I haven’t eaten beef in two years. Although, poultry, fish and eating ham occasionally are no better, the dinners we have been gravitating toward are more with beans, pastas and cheeses. My Zesty Pinto Beans and Rice Dish recipe I’m about to share with you is easy and deliciously different with the addition of the honey-dipping mustard complimented with zesty hot peppers balanced with tomato and onion, delicately browned to tasty perfection using extra virgin olive oil. You can make this for a quick lunch instead of a typical sandwich and be satisfied without worrying about your diet. To simplify your cooking, I suggest cooking up a one or two-pound bag of dried pinto beans at once. Usually I keep a portion of the cooked beans whole and the rest I mash in the food processor and store in the refrigerator for other recipes. Working with beans in this fashion will save you loads of time in future meal preparation because all you have to do is reach in for a container of either mashed or whole and create something wonderful. Use one cup of uncooked rice to two cups of water, bring to a boil, cover, and then put on low heat and cook for twenty minutes. I like to add about two cups of this cooked rice to stir into the cooked pinto beans and vegetables. The rest of the cooked rice I like to put on each plate before I serve and top with the combined mixture. However, you can adjust how much rice to your bean mixture accordingly. 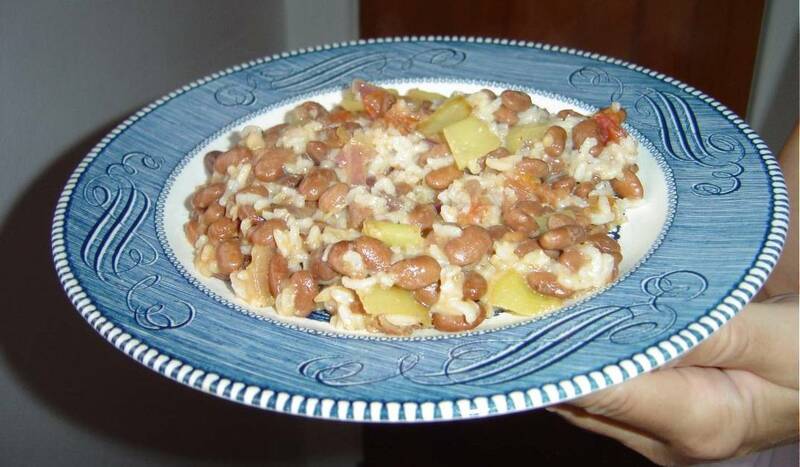 I really do hope you will want to try my Zesty Pinto Beans and Rice Dish recipe because it is special as well as good for YOU! Brown your onions and chopped peppers in the oil until golden. Add your chopped tomatoes and cooked pinto beans next along with your mustard, salt, cumin powder and stir in the two cups of cooked rice. Mix thoroughly together. Serve over some of the extra rice.